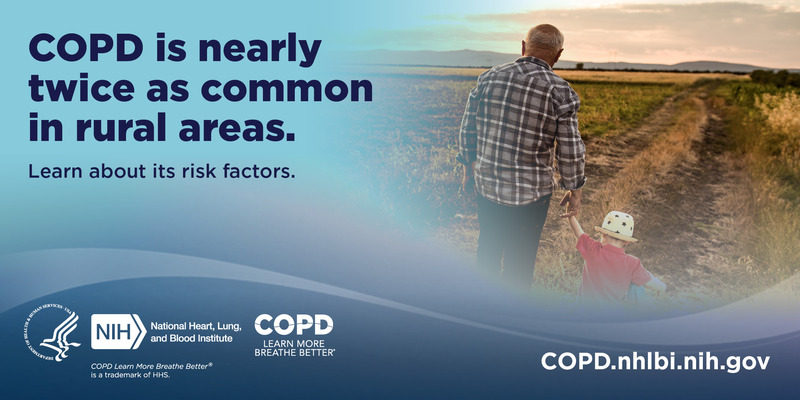 Help raise COPD awareness by using these Facebook and Twitter cover photos and by sharing these graphics on your social media channels. Find sample social media posts below. For additional resources, download our outreach toolkit. 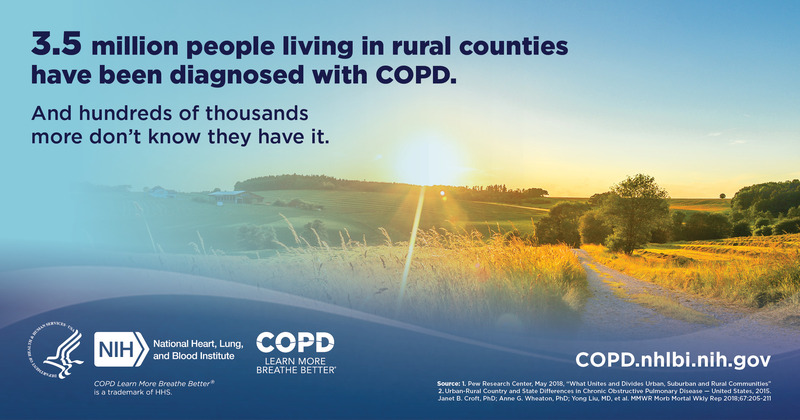 3.5 million people living in rural counties have been diagnosed with COPD. And hundreds of thousands more don't know they have it. COPD.nhlbi.nih.gov. COPD is Used to Describe Two Main Conditions: Chronic Bronchitis (inflammation & excess mucus) Emphysema (damaged air sacs). COPD.nhlbi.nih.gov. 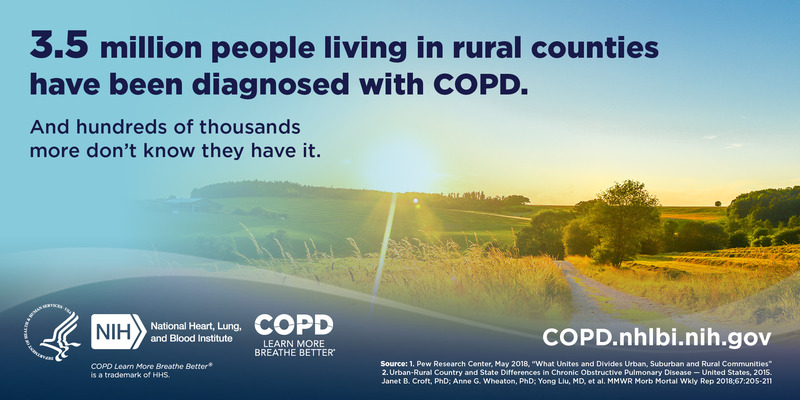 COPD is nearly twice as common in rural areas. Learn about its risk factors. COPD.nhlbi.nih.gov. 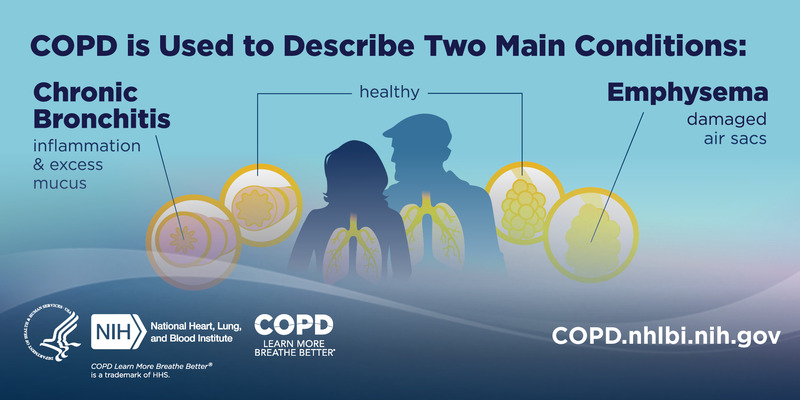 Everyone's experience with COPD is different. #COPDjourney. COPD.nhlbi.nih.gov. 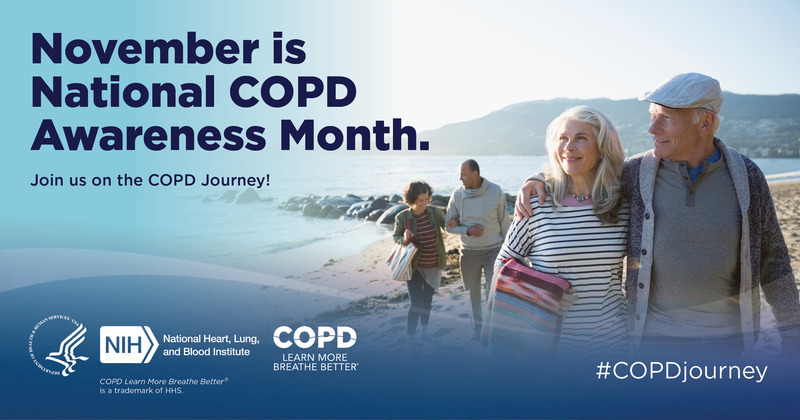 November is National COPD Awareness Month! 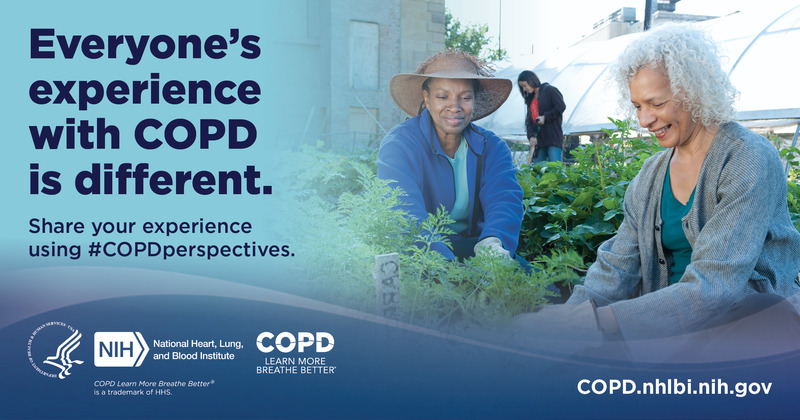 Join us & @BreatheBetter on the “COPD Journey: Perspectives” to raise awareness about the disease. Ongoing coughing, shortness of breath, wheezing or chest tightness? 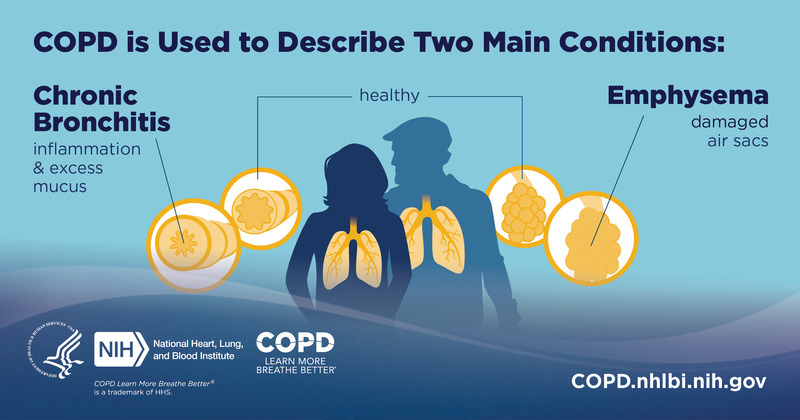 These are all signs of COPD but everyone will experience them differently. 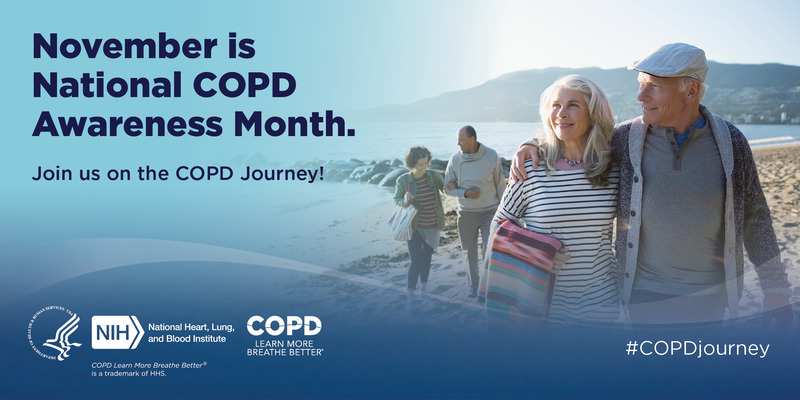 Follow along on the COPD Journey with us and @BreatheBetter to learn more about its signs and symptoms. Today is World COPD Day. According to the World Health Organization, the disease affects 251 million people worldwide. In the U.S., 16 million Americans are diagnosed with the disease and it is estimated that millions don’t realize they have it. But there is good news: COPD is manageable. Learn about treatment and management via @BreatheBetter. 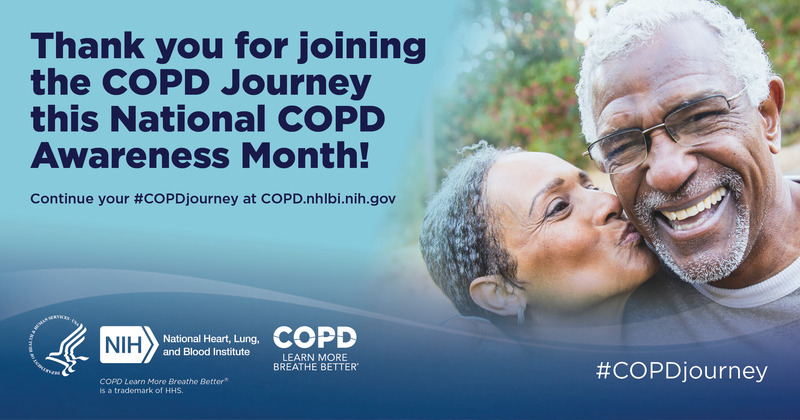 National COPD Awareness Month is almost over, but the COPD Journey continues. 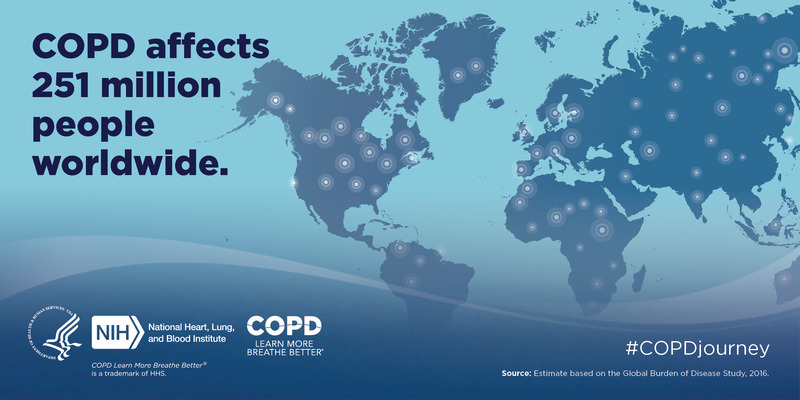 Last year, the COPD community released the COPD National Action Plan. It is a unified framework for everyone across the country to help reduce the burden of the disease. 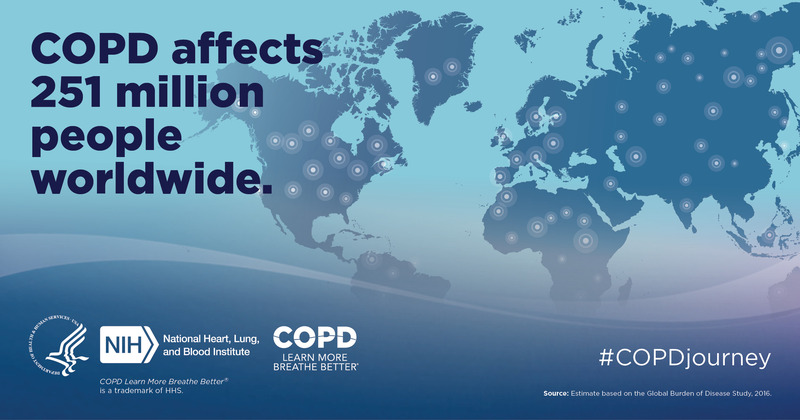 Join us, @BreatheBetter, and @NHLBI and learn more at COPD.nhlbi.nih.gov. 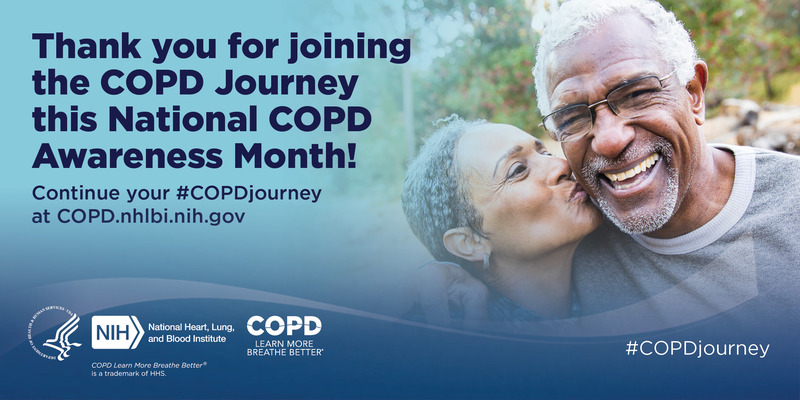 Thanks for joining us and @BreatheBetter on the COPD Journey this National COPD Awareness Month! To learn more and stay involved, visit [INSERT YOUR ORGANIZATION’S URL]. For additional resources, download our outreach toolkit. The #COPDjourney is not over! 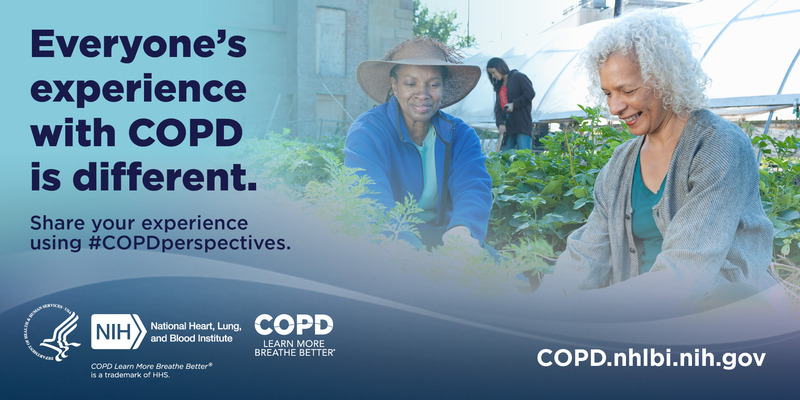 Last year, our community launched the #COPDActionPlan and we are joining with @NIH_NHLBI to continue to stay involved!